Mushroom Model Magazine continues their Orange series with a useful and detailed reference title on the Hawker Fury and Nimrod. The Hawker Fury, entering RAF service in 1931, represented the last generation of open cockpit fighters in British service. Its high performance climbing capabilities ensured that the Fury was assigned the role of a specialised interceptor in defence of the south east of England. The sleek Fury was also one of the most attractive and coloufully marked aircraft of the "Silver Wings" period. The author, Alex Crawford, adopts a logical approach to the subject. The text starts with a description of the concept and development, followed by RAF service entry and Squadron operations, including the Munich Crisis, and relegation to training duties. Next, foreign service with Norway, Portugal, South Africa, Spain, Yugoslvia and the Persian Fury are covered. This first part of the book comprises 52 pages. Now we move onto the Royal Nay's counterpart, the Nimrod. Although similar in appearance, the Nimrod was in fact a substantially new design with only the tail section in common. 38 pages are devoted to the development and operations of the Nimrod. These two sections are lavishly supported with many large, well captioned contemporary photos, and peppered with technical drawings and plans of the different variants. Pages 99 to 136 provide comprehensive walkarounds of several airframes, with many photographs of restored aircraft details - engine, cockpit and airframe. This will be especially helpful to modellers working on the sparsely detailed 1/48 scale Airfix and Pyro Fury kits. 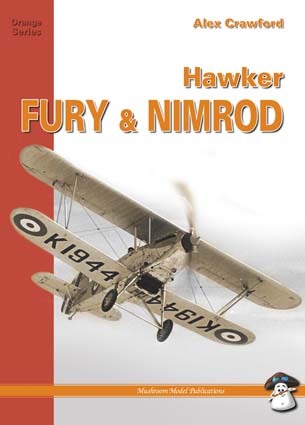 This title is rounded out with more than 50 colour profiles on Furys and Nimrods in a wide and wild variety of colour schemes and markings. This was one of the most colourful eras for RAF markings, and the profiles show these off to full benefit. A number of two and three view colour illustrations are also included in this section. A nice bonus is an A3 foldout sheet with 1/48 scale plans and specifications. Once again, Mushroom Model Publications has provided a one-stop reference for an important but oft neglected aircraft type. This title will be interesting to all RAF and Royal Navy aviation enthusiasts, but is especially helpful to modellers due to the ample detailed reference photos and line drawings, plus the inspiration of the attractive artwork. North American distributors are MMD, Australian distributors are Platypus Publications. In Europe, the books are available from any good bookshop (via our UK distributors, Orca). Contact MMP direct in case of difficulties. Thanks to Roger at Mushroom Model Magazine for the sample.